The maiden budget from Narendra Modi’s new government failed to live up to the reform hype. But a promise to do away with retrospective changes in the tax code is welcome. And while boosting spending on roads, ports and cities is a gamble, this could revive the investment cycle. India's Finance Minister Arun Jaitley (C) poses as he leaves his office to present the federal budget for the 2014/15 fiscal year, in New Delhi July 10, 2014. 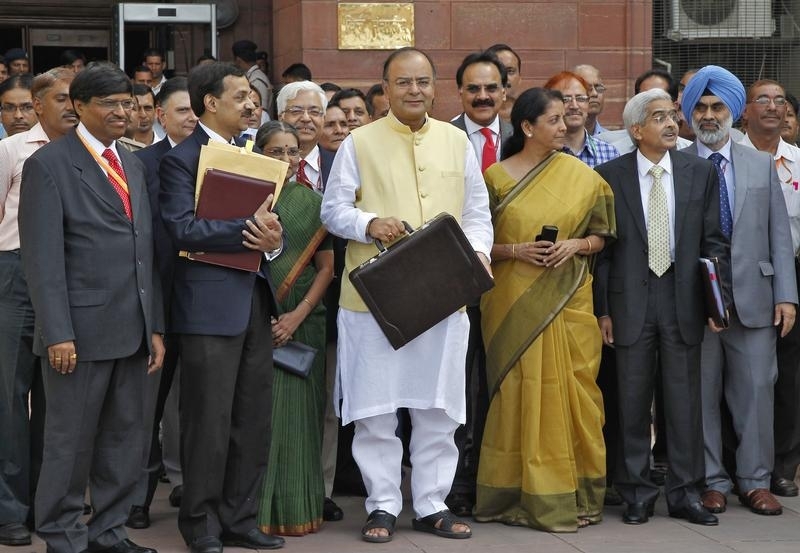 Finance Minister Arun Jaitley presented the new Indian government’s maiden budget in parliament on July 10. He said there would be no more retrospective changes in the tax code of the kind that left Vodafone with a surprise tax bill of more than $2 billion. The BJP-led government will spend 17.9 trillion rupees ($300 billion) in the current financial year, a 13 percent jump from the year that ended in March 2014. This includes 378 billion rupees on highways, 70.6 billion rupees for 100 “smart cities,” 50 billion rupees for boosting warehousing capacity, and 80 billion rupees on rural housing. India will allow up to 49 percent foreign ownership of companies in defence-related manufacturing and insurance, up from 26 percent, Jaitley said.